By the banks of the River Thames in the Historically significant location along the "Tecumseh Parkway" only steps away from where the British/Canadian Armed forces crossed the River in the war of 1812, is found 75 acres of Prime Arable Cash crop land, boasting loamy soils and level topography both ideally suited for high-value specialty crops, plus a drainage ditch that assists in drainage improvement. 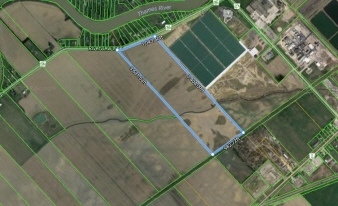 This superb 75-acre parcel is situated within the City of Chatham's City limits and has M-1 Zoning opportunities. The Greenfield Ethanol plant is only 2 minutes away and, a state of the art ultra-modern Greenhouse operation, utilizing Ethanol bi-products to maximize efficiency is found situated adjacent to this property, allowing for some additional interesting possibilities.